Friday you say? Fries Day I say! I sense that this is going to be the best day! 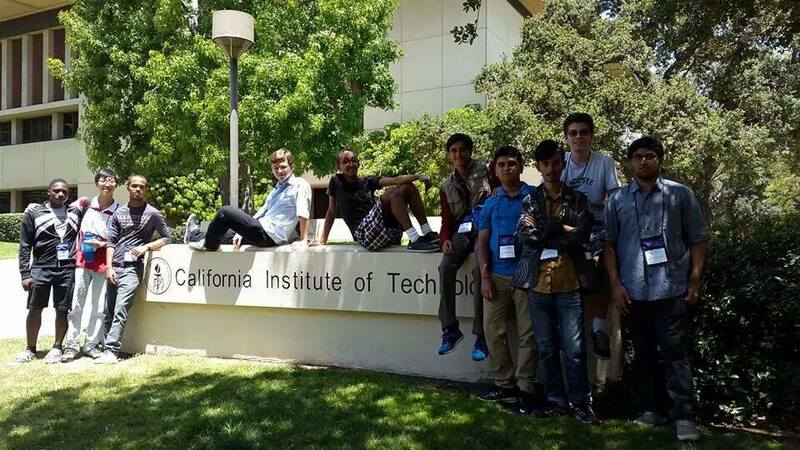 The guys from Brilliant at Caltech. Today was possily my favourite day so far. We started out with our morning symposium. My personal highlights were D. Richard Taylor, Nobel Prize in Physics in 1990, and John Branca, lawyer for some of the greatest musicians of our times, such as The Beach Boys and The Doors. After lunch, we took off for NASA's Jet Proplusion Laboratory, where we were guided through a tour of almost all the facilities. Visiting my furture work place has been possibly the second best experience for me in the whole week! In the afternoon we had a few more talks, among which Aber Whitcomb's stood out - he was the co-founder of MySpace! To end the day, we enjoyed watching people taking part in the talent show, after which we were joined by Peter, Calvin and Sue! Although it's sad that this campus is closing to its end, I just can't wait for tomorrow! Lesson of the day: If you want to acheive something great in your life, go to places that will open you as many opportunities as possible. Also, science is not democratic: if you're right, you're right - even if anybody else disagrees. Of course, this also goes for when you're wrong. some of the greatest musicians of our times, such as The Beach Boys and The Doors. Our time? How old are you? What are they? Contemporary musicians? HAHAHA I think he just means recent history. We met someone today. Guess who it was! @Mursalin Habib – The Brilliant staff. Way to ruin the surprise, man! I was trying to build up suspense! @Finn Hulse – No he didn't :) Petru posted at 0925 GMT on 21st June, and Ritvik posted at 0421 GMT on 21st June. Going to Nasa Jet Propulsion Lab. Habib, you know, I actually worked a short stint there as an IBM 360 computer programmer in the prehistoric past. It was the first time I heard of "reboot" as a technique, and whenever it was done, it was a big deal. It wasn't done just by pushing a button. JPL was a fun place, I wish I could have worked there longer in a different job. Visiting JPL was awesome, our guide seemed to really like talking about NASA and all those things. Seeing real Curiosity Rover models was amazing! In particular, Aber Whitcomb(MySpace co-founder and CTO) and James Ellroy(novelist) gave amazing speeches about their jobs, background, failures and achievements. The Talent Show was cool, although it was quite short and improvised. To end the day, we met Peter, Calvin and Sue!!!!!!!! !